When 99% of the country is water and if you want to experience all that Maldives has to offer. 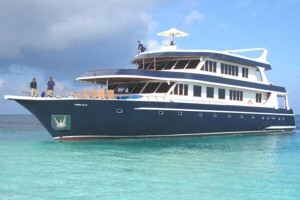 Then you would need to book a live aboard vessel which is commonly known as Safari Vessel or cruise vessel. It is the Maldivian version of a fully equipped modern caravan, which enables you to travel through out the country. A cruise vessel or live aboard vessel is a fully equipped live in vessel with Bed rooms (most with double beds) attached toilets , Air condition a sitting and lounge, sun decks, Kitchen and dinning areas to mention a few. The crew would be trained sailors as well as qualified chefs. The vessels are equipped with Sound Proof generators providing electricity, Desalination Plants providing fresh water, Global Positioning Systems, Radio Telephone, Mobile Phones, Television , DVD players. By choosing to live aboard it enables you to constitute your own itinerary, depending on your interest you could visit the various dives spots Maldives has to offer or go on a Surf safari known as "surfari" and as an added bonus you could sunbath at an uninhabited island in total privacy or have a barbecue on the beach, Visit a local island or just cruise the Maldivian waters to your hearts content sipping champagne watching the magnificent Maldivian sunset or sunrise with its spectacular colours. Below is a typical 7 nights/ 8 days dive safari itinerary. Day1:Arrival and pickup from Airport, sail to Laguna Beach Resort. Snacks and refreshments served on the trip. Visit the resort . Have Dinner onboard , later visit the resort bar. Day 2: Breakfast. Depart for Rashoo Atoll (4-5 hours). Morning Dive. Lunch on board. Afternoon Dive. Anchorage in Lagoon of a resort. Visit the island. Dinner onboard. Visit the resort bar. travel time). Lunch near Mayafushi. . Visit Resort/ AfterNoon Dive. Dinner Onboard. Day 5: Breakfast. Morning Dive at Shark point. Depart to South Ari Atoll. Lunch on route. Afternoon Dive. Anchorage in Fishing Village. Visit Island. Dinner onboard. Day 6: Breakfast. Depart to Dangethi. Morning Dive Anchorage by uninghabited island. Lunch onboard. Sunbathing on uninhabited island. Night Diving. Dinner onboard. Day7: Breakfast ,. Morning Dive. Lunch onboard. Travel to Male'. Visit Male' the Capital.. Afternoon dive. Anchorage near Club Faru. Dinner onboard. Visit the resort bar. Day8. Breakfast. Depart to airport.